I’ve written several times before about Jazz piano trios, as this is one of my favorite art forms, be it with Shai Maestro, Keith Jarrett, or Edgar Knecht. I’ve already mentioned that Europe in the Shai Maestro post that many of today’s Jazz piano trios seem to come from Europe. Germany is one of the hotspots. Don’t ask me why, maybe it is because there are enough Jazz schools around to produce outstanding musicians, but these days, there are quite a number of German trios that deserve to be better known than they are, including Julia Hülsmann, the Tingvall Trio, the already mentioned Edgar Knecht, Michael Wollny’s excellent efforts, etc. etc. Triosence was started by Bernhard Schüler on piano, Stephan Emig on drums and Matthias Nowak on bass, but the latter has been replaced by Ingo Senst. Both Schüler and Emig come from the same German town of Kassel originally, a rather ugly industrial place that has been completely destroyed in the 2nd world war and unfortunately rebuilt with too much cheap concrete. It cannot be this city that has inspired so much beautiful music. I currently have four of their seven officially released albums including First Enchantment, Away For A While, One Summer Night (Live), and Turning Points, and all of them are highly recommended. I’ll eventually add all of their albums to my collection. 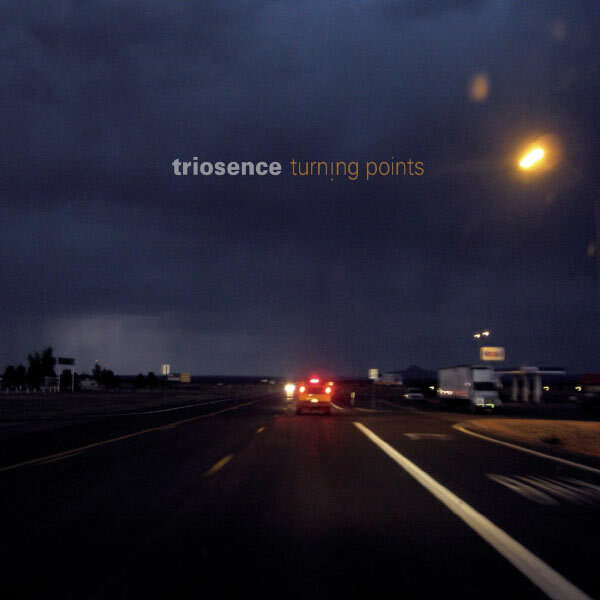 As an example of their production, let me write about their 2013 Sony album “Turning Points”, which happens to be my favorite (but by a very slight margin, as the other are really great as well). It already starts with my favorite track, No One’s Fault. Why do I like this track so much? Well, it gives me just what I want most: beautiful melodic development. I’m a sucker for melodies. My mind is probably rather simple, I just love melodies. This is probably one of the reasons why atonal classical, free jazz etc are just not my cup of tea, my little brain cannot cope with that freedom. But give me a beautiful melody, as developed here by Schüler, add beautiful bass lines including a lot of use of the bow by Emig, and just the right amount of drums (I personally hate it when drummers overdo it), and I’m in paradise. My other 5 star tracks on this album are the ballad Your Nearness, the groovy Go For It, and their beautiful interpretation of the Kurt Weill standard Speak Low, where the bass gets to play the melody for a while. By the way, the group has gone multimedia and published a free iOS app with this album, which is worth checking out, even if you don’t speak German, as it contains the scores (lead sheets) to all the tracks, and some videos & picture: Turning Points iOS app.